The Bharatiya Janata Party (BJP) seems convinced that the rush of entrants — prominent and low-profile — in the party over the past few weeks is a marker of the upper hand it holds over the Congress and the Opposition in the Lok Sabha polls. Defections and departures are normal before an election because it is not as though the Congress and other parties have not seen turncoats gravitating in search of tickets. 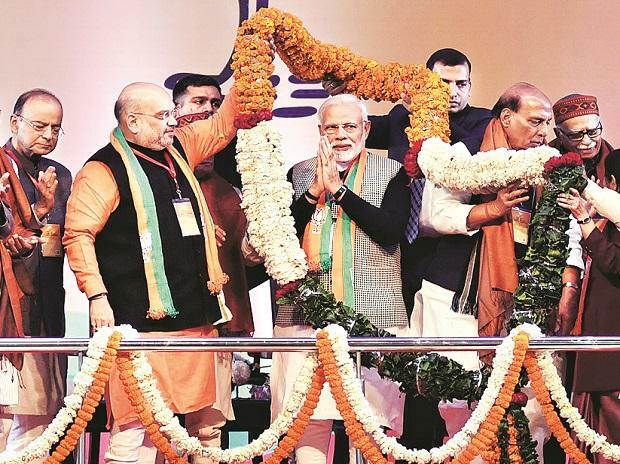 However, since 1996-- when the BJP began its independent ascent towards power in the Centre –it sought to beam larger signals through the political arch over rather than projecting it as a one shot move to grab a Lok Sabha seat. It was imperative for the BJP to establish itself as the prospective nucleus of a national pole and try and fill the vacuum that was visibly created by a Congress on the downslide. The tactic of pulling in even second and third-rank worthies from other parties was apiece with a larger strategy to show itself as the Congress’s alternative. The latest round of desertions and defections was kicked off with the induction of four Gujarat Congress legislators, whose arrival was celebrated with added zest because it coincided with a Congress Working Committee meeting at Ahmedabad. In neighbouring Maharashtra, Sujay Vikhe Patil, the son of a Maratha leader of the Congress, Radhakrishna Vikhe Patil, joined the BJP ostensibly because the Nationalist Congress Party (NCP) refused to yield the Ahmednagar Lok Sabha seat to him. From the BJP’s stand-point, Vikhe Patil junior’s induction served three purposes: notwithstanding its recent success in Maharashtra, it has still to carve out a caste territory unlike its partner, the Shiv Sena, that has a committed following from the other backward castes. An upcoming Maratha leader was the sort of resource person it looked for. Second, the desertion showed up the cracks in the Congress-NCP alliance, not that the BJP is free of issues with the Sena. Third, the move reinforced the BJP’s willingness to accommodate renegades with tickets without ado (so long as they brought value to the table) and take the politics of patronage and reward to another level. Gujarat was another piece of business. Here, the BJP’s supremacy is unquestionable despite the setback it suffered in the 2016 assembly election. The Congress, that looked all set to revive, is getting hollowed out from inside with the exit of five MLAs, who went to the BJP and were promptly and suitably blessed. The blessing didn’t come without a tab. Nor were the legislators inducted for a lark. Of the five (the first, Kunwarji Bavaliya crossed over in July 2018, was made a minister in the Vijay Rupani cabinet, and subsequently won a by-election), barring Asha Patel, all are from the backward castes. Bavaliya and Parsotam Sabariya are Koli, Vallabh Dharaviya is a Sathwara and Jawahar Chavda is an Ahir (Yadav). The BJP assiduously built a vote bank of the backward castes who strikingly remained insulated against the wave of empowerment that overcame north India, post-Mandal. In 2012, before the elections, Narendra Modi (then the chief minister) crafted a strategy to coalesce the huge OBC vote bank in the state and use it as a counter against the traditional Patel dominance. Whether the tactic yields the projected pay-offs in the Lok Sabha polls is to be seen. Over to the East and West Bengal. Arjun Singh, formerly of the Trinamool Congress, was showcased as a high-profile induction. Apart from underscoring the advantage of having a person like Mukul Roy, once Mamata Banerjee’s closest political associate, Singh, a four time MLA from Bhatpara in North 24 Parganas, is likely being fielded from Barrackpore against the Trinamool’s Dinesh Trivedi in the Lok Sabha election. Singh draws added clout from heading the Bhatpara municipal corporation. The Bengal back-fence talk was Mukul came into the BJP in 2017 a week after the Enforcement Directorate (ED) had summoned him for interrogation in the Narada sting case. Serendipitously or otherwise, he was untouched thereafter. Single-handedly he ferried across Mamata’s ‘malcontent’ to the BJP and created an aura that it was the Trinamool’s real challenger and not the Congress and Left Front. However, the individual who proved he was worth his weight in gold was Assam’s Himanta Biswa Sarma. He calls the shots for the BJP in the north-east. He quit the Congress ostensibly because Rahul Gandhi wouldn’t give him the time of day. Sarma sewed up alliances in virtually every state and pulled off a coup of sorts last week by getting back an estranged Asom Gana Parishad (AGP) in the National Democratic Alliance (NDA) to batten up the hatches against the fall-out of the agitation on the amended Citizenship Bill that was since thrust in deep freeze. There were others too who make up a mixed bag. In Odisha—where the BJP desperately wishes to break in but is constrained by a paucity of candidates—the Biju Janata Dal (BJD) has been tapped. The chief minister Naveen Patnaik’s former colleague, Baijayant Panda, is perceived as a “prize” acquisition although the prospect of a re-election from Panda’s old constituency, Dhenkanal may be in doubt without the BJD’s organisational infrastructure and Naveen’s charisma. The BJP’s history shows that among its acquisitions down the years, the most successful were Yashwant Sinha (from being a spokesman, he became the Finance and External Affairs minister) and PR Kumaramangalam, who held various big ministries, notably Power, in the Vajpayee government until his death in 2000. Those were the days when the Rashtriya Swayamsevak Sangh (RSS) indubitably called the shots in the BJP and the government. Sinha and Kumaramangalam were quick on the take. Sinha used the “swadeshi economics” line to warm up to the Sangh, while Kumaramangalam regularly called on the then “sarsanghachalak” Rajendra Singh to enquire after his health and procured imported medicines for him.